I love buying for Christmas, so I thought I'd put a little series together to showcase some potential gifts for him and her etc. 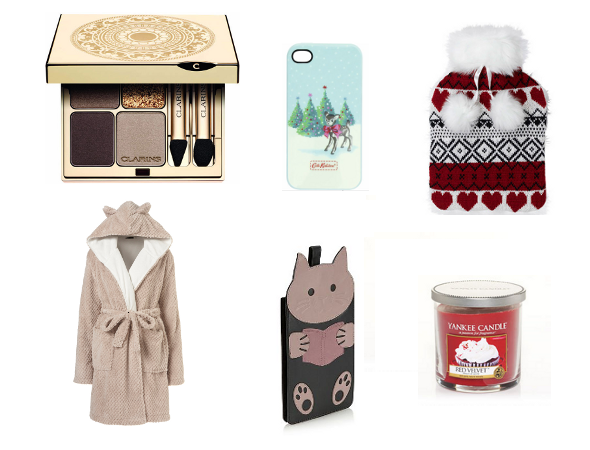 Today's post features gifts for her. I'd personally love to receive any of these, how cute is the Kindle cover?! Wow the Clarin's make up palette is gorgeous, my make up isn't as fancy as that! I love the gold/bronze shade. Oh I know, it's been on my wishlist ever since it's release! As a gift I think the price is totally justifiable, I don't think I've ever seen a palette as luxurious looking as this!